A new cycling (and walking) bridge has recently been opened in the Dutch city of Zwolle. It’s an attractive structure, around 50m long and 7.5m wide – nothing particularly remarkable by Dutch standards. What is remarkable (to me at least) is the purpose of this bridge. It doesn’t cross a river, or a railway line, or some other physical barrier that couldn’t be crossed without it. It only crosses a road where there was already an existing (direct) singe-stage cycle crossing, which I used a number of times when I visited Zwolle in the summer earlier this year. I didn’t find the delay particularly remarkable; perhaps only 30 seconds or so, each time I used it. In fact in the video I took (in the post, below), it so happens that I wasn’t delayed, at all. You can see that crossing (and the road) on Streetview. Six lanes are crossed in one go. Now that the bridge is open, it has taken this crossing completely out of the equation. The road is now crossed on the new cycle bridge, which runs approximately parallel to the railway bridge just visible in the background. The road can be crossed without any delay, and in complete safety. In essence, the purpose of this whole major construction project is simply… to remove a minor bit of inconvenience for people cycling. Here is my video, taken using the route the bridge will replace. As you can see, it’s actually very good by British standards – but evidently not good enough. The bridge will remove the potential for any delay. Now that the bridge is in place, the new developments to the north of Zwolle are connected to the city centre without any traffic lights at all. Another major road is crossed on another spectacular bridge, all part of this same route, allowing painless cycling, right into the city centre, in complete safety. The reason I had been anticipating the new ‘yellow’ bridge appearing was because I had spotted the engineering works taking place while I cycled past them in the summer. Here is the view northbound, towards the road being crossed. This whole project exemplifies of the seriousness with which cycling is taken in the Netherlands. It’s a major engineering scheme, just for cycling, for a pretty minor benefit. Cities like Zwolle and Utrecht, which already have very high levels of cycling, are pushing for more; not resting on their laurels, but building in extra convenience and safety where they can, even at tremendous expense. It’s amazing to see, and definitely something that Britain can – and should – aspire to. I’ll wager that this was done to the benefit of motor traffic as much as it was done for bikes. Removing the main level crossing of a main road will certainly have good operational benefits for the traffic signals too. That was my thought as well. Replacing the at grade crossing should mean more green time for the drivers on the road. I’m not 100% sure, but I think the crossing will be staying in place even when the bridge was there, to allow people to cross the road at this location. Not everyone will be heading in the direction I took in the video (i.e. due N-S) – others may just be crossing the road with a more local movement. It sounds higly likely to me that indeed the level crossing will stay in place for the reasons you mentioned. However, the cycling green signal may be demand-based, so effectively if very few cyclists remain at the level crossing, there could be a benefit to motor traffic too. 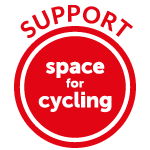 What a coincidence: my blog published last night also refers to Zwolle, as I needed a comparison to my borough of Basingstoke & Deane whose cycling strategy is out for consultation. In Britain any bridge will go to a massive clearance over the road. This means that cyclists and pedestrians have a serious hill to climb. Typically the ramp will double back in a sharp corner making it a pain to cycle. Linguistic question prompted by the first tweet in the post: would I be right in presuming ‘opening’, ‘hard’ and ‘top’ are all borrowings from English? And that ‘top’ means something like ‘the best’ or ‘very good’ as in ‘top work’, so an example of the quite common (in some languages at least) borrowing of English words to mean something close to but not exactly the same as the original? Not sure I agree with this post’s focus, or that the claim in the post’s title – “to remove some minor inconvenience” – covers all the reasoning for this investment. There are two references to “in complete safety” in the text and another mention of safety in the final paragraph, but the post in general doesn’t make much of this benefit. For me the reduced risk is a crucial factor, despite the previous layout appearing to be relatively safe with good visibility and a signal controlled crossing. I wonder if it was a notable factor when the decision was made to build this bridge, and would be interested to hear more if anyone knows the details for this scheme or just has more general information on how schemes are prioritised and justified in NL. ps As a momentumist who’s not averse to a little risk, I’d probably notice and appreciate the increased convenience more than the improved safety. However, as a campaigner I think our authorities will (sadly) have little interest in our convenience, so I would campaign for the safety benefits (and reduced delays to other modes) too. You think our authorities are interested in cycling safety? I agree that safety is also an important reason for this kind of improvement – sorry if there wasn’t enough emphasis on that in the post. Your comment did remind me to check the Dutch collision statistics map, however. (Available at http://ongelukken.staanhier.nl) Interestingly enough this junction wasn’t particularly problematic – only one cycling injury in the last ten years. The reason this bridge was built, as far as I can tell, is because the cycle path is a so called fietssnelweg, a controlled access highway for bicycles, connecting the towns of Zwolle and Kampen. On a controlled access highway you want to minimize the number of at grade crossings, even if these crossings are otherwise safe. This is what happened here.